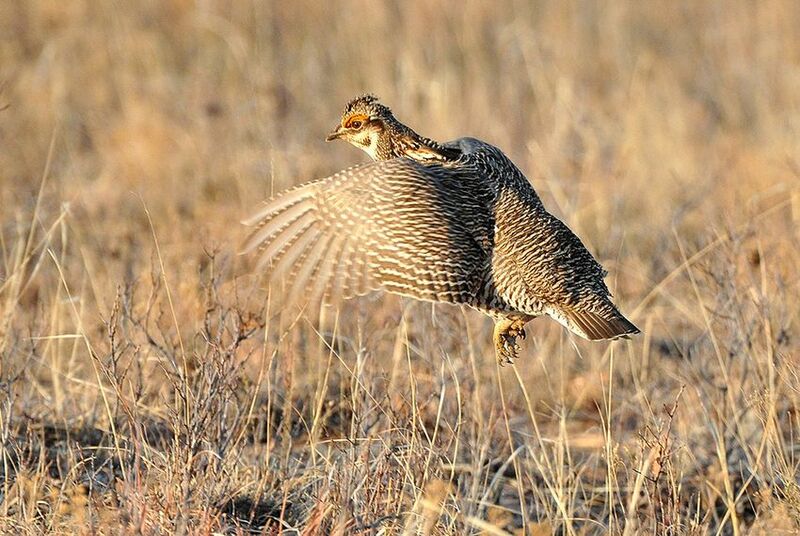 Some of Texas’ biggest oil and gas lobbyists are hoping to take control of the fate of the fast-disappearing lesser prairie chicken — much like what happened with the dunes sagebrush lizard earlier this year. Some of Texas’ biggest oil and gas lobbyists are hoping to take control of the fate of the fast-disappearing lesser prairie chicken — much like they did with the dunes sagebrush lizard this year. In June, Beatty Bangle Strama, a law firm whose attorneys lobby for ExxonMobil, created a nonprofit called the American Habitat Center. (The incorporation document can be found at the website for the secretary of state in Colorado, where it was filed.) The center was set up to administer a future "mitigation bank" that would allow the five biggest oil companies in the Permian Basin, where the grouse is found, to pay into a system that allows landowners to help conserve and restore the chicken's habitat. Few have seen the plan for the bank, which was written by the nonprofit advocacy group Environmental Defense Fund in conjunction with several major oil and gas companies, as well as Katharine Armstrong of the firm Natural Resources Solutions. David Wolfe, director of conservation strategies at EDF, said the plan would be released to the public soon and declined to provide a copy. The Texas, Kansas and Oklahoma farm bureaus, along with ExxonMobil, BP, Chevron, Sandridge and Chesapeake Energy all signed the plan and submitted it to the U.S. Fish and Wildlife Service in May. The American Habitat Center's function would be similar to that of the Texas Oil and Gas Association’s Texas Habitat Conservation Foundation, which allows companies to voluntarily enroll land they are leasing or own for development and buy credits to offset habitat disturbance for the dunes sagebrush lizard. But that program, which has come under fire over transparency concerns, was set up to prevent the U.S. Fish and Wildlife Service from listing that species as endangered. In contrast, those involved in the setup of the American Habitat Center say they expect the lesser prairie chicken to be on the endangered species list by next March. Wolfe said his organization’s plan, sometimes called the Stakeholder Conservation Strategy or Wildlife Habitat Exchange, would provide that certainty. Companies would pay to enroll their land in the program (75 cents an acre and $80 per oil or gas well, according to a PowerPoint presentation on the plan), and a formula would determine how much impact that company might have on the bird’s habitat. Then they could buy credits that landowners generate through enrolling their own property in the project, agreeing to follow certain conservation strategies. But not everyone agrees. Smaller energy companies in particular are worried that prices for credits will skyrocket and that they won’t have the deep pockets to pay. Many did not enroll in the Habitat Conservation Foundation’s lizard program, though it is impossible to know which ones may have because the enrollees are secret. Shepperd said the plan, like the conservation strategy for the dunes sagebrush lizard, would simply create a “cottage industry” for land. The Texas Oil and Gas Association says it is not involved with the plan, and vice president Deb Hastings said she’d never heard of the American Habitat Center. But many of the biggest energy companies, all of whom are TXOGA members and on its board, are involved in high-level discussions on the plan — ExxonMobil, Chesapeake Energy, Chevron, BP, Sandridge and XTO Energy, according to the executive summary of the plan. Comptroller Susan Combs’ office, which oversees the lizard plan, says it is not involved in the discussions either. But the comptroller’s website does link to a Wall Street Journal article featuring the plan. Combs has expressed concerns with a competing plan called the Range Wide Plan, or the 5-State Plan, which wildlife agencies in Texas, Colorado, Oklahoma, Kansas and New Mexico have worked on for years. They are expected to submit their fourth draft of the plan in September to the U.S. Fish and Wildlife Service in hopes of preventing the lesser prairie chicken from being listed as an endangered species. Those who have worked on the Range Wide Plan, including Texas Parks and Wildlife and the Western Association of Fish and Wildlife Agencies, say it is an unprecedented regional effort to conserve a species and has received more than 1,000 comments in the past several months. But in letters to stakeholders. Combs warns that it does not plan for the possibility that the chicken could be listed. Last week, Gov. Rick Perry’s office asked Texas Parks and Wildlife expert biologist Sean Kyle not to attend a meeting related to the Range Wide Plan — prompting concerns among proponents that Perry was giving in to Combs’ opposition. “It’s potentially dangerous,” Shepperd said. “If you take Texas out of the plan, the plan falls apart.” The chicken would almost certainly be listed if that happened, Shepperd said. Perry spokeswoman Allison Castle said the governor’s office was looking at all possible options and was responding to many expressions of worry over the plan.